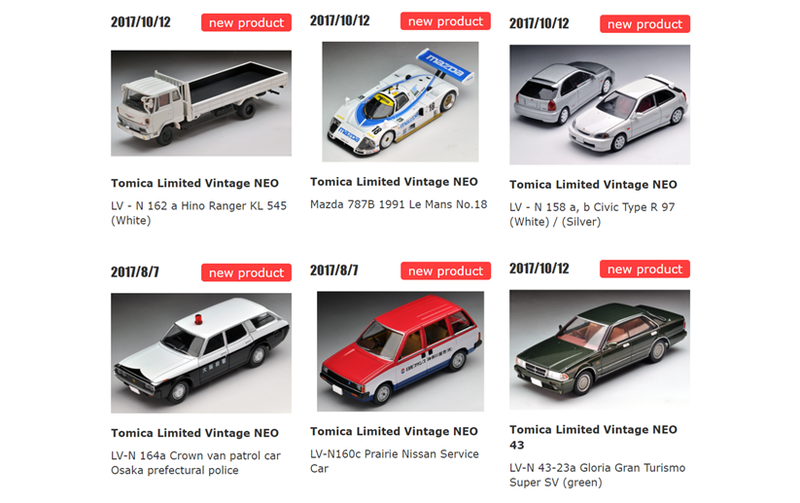 Tomytec has recently unveiled the Tomica Limited Vintage releases scheduled for February 2018. Two new castings have been announced in 1:64 scale, along with a new version of the 787B, plus two more releases in 1:43 scale. The Crown van and Prairie commercial were announced a couple months ago for a February release. The most widely anticipated model for February is probably the newly-cast Honda Civic Type R (LV-N 158). The model here is of the EK9 Type R, the first Civic Type R, which was introduced in 1997, with a special 5-speed transmission, limited-slip differential, no sound deadening, red Recaro seats, and a high-revving 1.6L four-cylinder producing 185bhp. The Toyota Crown van release for this February (LV-N 164) is a patrol car in the livery of the Osaka Prefecture Police. This cargo version of the Crown wagon was introduced for January in grey and bright green (LV-N 163). Passenger versions of this generation were introduced earlier in a special box for the Taiyo TV show and in white and pale blue (LV-N 108). The Nissan Prairie commercial for February (LV-N 160) is in the classic Nissan Service livery. This cargo version of the Prairie was introduced for January in very plain white or silver (LV-N 160). Passenger versions of this generation were introduced earlier in special Ogikubo packaging, and in two colour schemes for a regular release (LV-N 115). Other releases in the Nissan Service livery include the Nissan C80 3.5 ton truck (LV-75), Datsun Bluebird 510 (LV-144), Nissan Skyline van (LV-50), and the Datsun 320 pickup (LV-15). The Mazda 787B release will depict the No.18 car (chassis 001) in Mazda factory livery that was entered in the 1991 24 Heures du Mans alongside the famous No. 55 Renown 787B (chassis 002) that won outright. This car was piloted by Stefan Johansson, David Kennedy, and Maurizio Sandro Sala in this outing. No. 18 started 23rd, No. 55 started 19th, and No. 56 (a converted 787 chassis) started 30th, and they would go on to place 1st (No. 55), 6th (No. 18), and 8th (No. 56). The Hino Ranger KL-SD (LV-N 162) is a new cast depicting a popular 4-ton truck. Detailed information is quite difficult to come by, like many larger trucks. (Google) Translation of the Tomytec page suggests that many future releases are likely because of a strong reception at the All Japan Model Hobby Show. In the 1:43 lineup, two more versions of the Y31-generation Nissan Cedric (LV-N43-22, left) and Nissan Gloria (LV-N43-23, right) will be released. As has become the practice, these are very slightly differentiated (different trim/facelifted or not) than previous releases of the same generation. These releases are described as pre-facelift Gran Turismo SV hardtops.